Travelling to New Zealand has long been on my list of places to visit and as I look at the crisp golden yellow and auburn leaves falling from the trees and blowing ever so softly in the breeze, I cannot wipe the smile from my face. I am currently in New Zealand with STA Travel exploring Queenstown ahead of the snow season on the super pretty South Island. We’ve been here for three days and so far it’s been packed with extreme adventure, wide open spaces, dramatic landscapes changing course every corner we turn and naturally, New Zealand’s clean, crisp air. Joe’s Garage Arriving in Queenstown the previous evening, we set out early in the morning to explore the township of Queenstown and to enjoy a hearty breakfast at Joe’s Garage. A local institution, this ski lodge inspired eatery is a favourite amongst locals who chat lively to the chefs cooking in the open kitchen. Here we fueled up on hot chocolate, poached eggs, grilled tomatoes, and sautéed spinach with lemon hollandaise. Lake Wanaka After breakfast, we jumped in our car and drove over an hour north of Queenstown to Lake Wanaka. 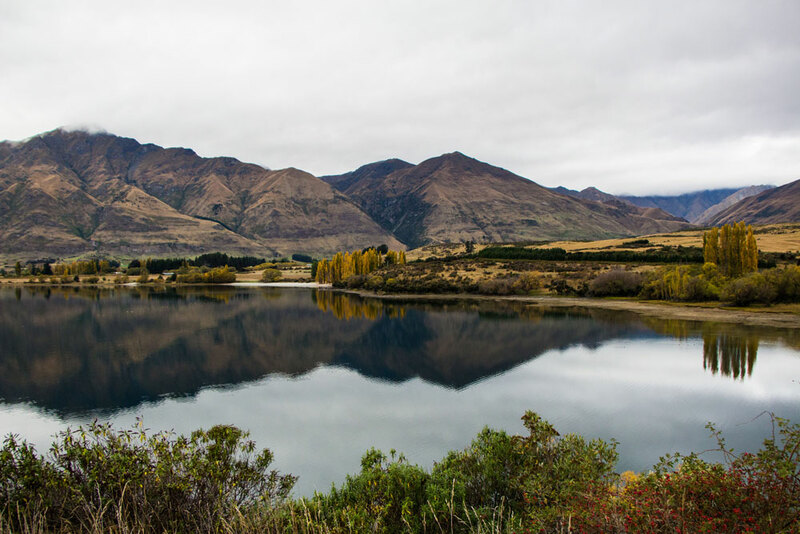 Located in the Otago region of New Zealand in the heart of the Otago Lakes, Lake Wanaka covers an area of 192 square kilometres, at an altitude of 300 metres. The township is situated in a glacier carved basin on the shores of the lake and is the gateway to Mt Aspiring National Park. The road to Lake Wanaka is windy and the vistas otherworldly. Upon reaching the lake we stopped by Roys Bay, a quiet pebble cove and walked along the shore, exploring the low lying vegetation and watching the Kite’s soaring above, we couldn’t help but stare at the indigo coloured water for long periods of time - it looked like navy silk. We soon jumped back in the car and ventured around the lake by way of Mt Aspiring Road. Here we went off piste, explored the lakes secluded bays and inlets, and marveled at the impossible beauty of Parkins Bay. Onsen Hot Pools Driving back towards Queenstown after exploring Lake Wanaka, we decided to indulge at the Onsen Hot Pools. The perfect spot to unwind and soak up Queenstown’s wide open spaces, we enjoyed an open air hot onsen. Upon arrival we were taken down to our private timber onsen, which comes complete with a rainforest shower. We chose to retract the roof so the private onsen was completely outdoors. Stepping into the hot water we immediately immersed ourselves in the surrounds, enjoying the views of the Shotover River and surrounding mountains. We wanted to pamper ourselves so we enjoyed champagne with a bowl of seasonal fruit. Towels are also $3 each, if you are unable to bring your own. Perfect for a group of friends, a family, lovers or going solo, the Onsen Hot Pools are the perfct way to indulge after a long day of exploring or skiing. Eichardt’s Hotel After our relaxing hot onsen, we drove back into Queenstown for dinner at Eichardt’s Hotel. A luxury hotel, Eichardt’s has a legendary tapas bar, perfect for those looking to escape the bustle of the township and relax in front of a roaring fire. Located on the lakefront of Lake Wakatipu, we sat at Eichardt’s Bar to enjoy a selection of tapas including squid ink calamari, seafood chowder and a charchuterie board with pickles and sour dough. The bar strikes the perfect balance between rustic and elegant with low lying tables, worn leather couches and a wine list featuring New Zealand’s best vineyards and grapes.